Photo of the Week. Summertime is for rainbows, which are caused by refraction and reflection within falling raindrops. 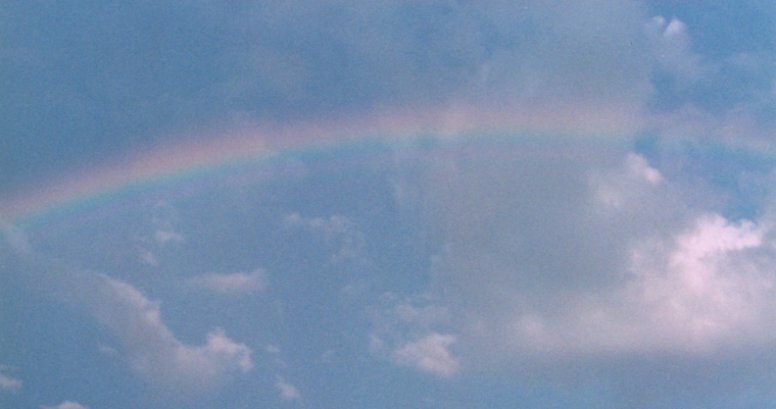 This one has a particularly prominent reddish "supernumerary bow" that lies below the main rainbow (and is caused by the interference of light waves within the the same droplets). Astronomy news for the three week period starting Friday, July 14, 2006. Skylights will resume its normal weekly schedule on Friday, August 4. Thanks for your interest and patience. This triple-week term is celebrated by three passing phases of the Moon and by a trio of occultations (though none of the latter are visible in North America). We begin the period with the Moon in its waning gibbous phase. It then passes through third quarter on Monday, July 17, to waning crescent, then through new on the night of Monday the 24th to waxing crescent, then finally through first quarter the morning of Wednesday, August 2, to waxing gibbous. On Friday, July 14, the Moon occults (passes over) Uranus (visible from South Africa and southeast Asia), on Thursday, July 27, Mars (Europe and Britain), and on Monday, July 31, Spica (southern South America). The evening of Thursday, July 27, North Americans however will see the thin crescent just up and to the left of the red planet, while the night of Monday the 31st will find the near-quarter passing to the south of Spica. Earlier in the period, watch the descent of the waning crescent into eastern dawn. The morning of Thursday the 20th, the Moon will sit just to the east of the Pleiades star cluster in Taurus, while the following morning it will be well to the left of reddish Aldebaran. The next two mornings, the Moon will be visiting with Venus (which still rises at dawn), and will appear above the brilliant planet the morning of Saturday the 22nd, then to the left of it the morning of Sunday the 23rd. That same morning, Venus will be less than half a degree from the star Tejat, Mu Geminorum. Then wait through new until near first quarter. The night of Tuesday, August 1, the Moon will lie to the southwest of bright Jupiter, while the following evening it will have flipped to the other side of the planet. The night of Thursday, August 3, look for the Moon to the west of Antares in Scorpius. Saturn is now invisible in bright twilight, while Mars, setting just a half hour before twilight ends, is quite difficult to see. On the evening of Saturday, July 22, the planet will be but 2/3 of a degree from Regulus in Leo. Jupiter (in western Libra) now dominates the night. Around July 17th, the giant planet moves entirely into the western sky, setting at local midnight (1 AM Daylight Time), while by the end of our period, it sets at midnight Daylight Time. Finally, Mercury invisibly passes inferior conjunction with the Sun (when it is more or less between us and the Sun) on Tuesday, July 18. Spica and Virgo are now well to the southwest as the sky darkens. Look to the left of the bright star for Libra, then to the right to find the box that makes Corvus, the Crow (or Raven), whose top two stars point back to Spica. Beneath Spica lingers the tail of Hydra, the Water Serpent, while even farther down northerners can see the top of the huge bright constellation of Centaurus, the Centaur.